This example uses the VARIABLE_COLUMN_LOG_PARSE function to manipulate strings in Kinesis Data Analytics. VARIABLE_COLUMN_LOG_PARSE splits an input string into fields separated by a delimiter character or a delimiter string. For more information, see VARIABLE_COLUMN_LOG_PARSE in the Amazon Kinesis Data Analytics SQL Reference. Choose Create Kinesis stream, and create a stream with one shard. 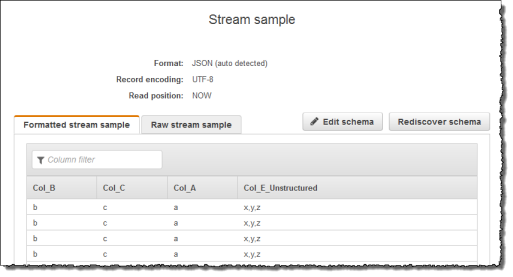 For more information, see Create a Stream in the Amazon Kinesis Data Streams Developer Guide. Run the following Python code to populate the sample log records. This simple code continuously writes the same log record to the stream. Open the Kinesis Data Analytics console at https://console.aws.amazon.com/kinesisanalytics. Choose Create application, type an application name, and choose Create application. On the application details page, choose Connect streaming data. Choose the stream that you created in the preceding section. Choose the option to create an IAM role. Choose Discover schema. Wait for the console to show the inferred schema and samples records used to infer the schema for the in-application stream created. Note that the inferred schema has only one column. On the application details page, choose Go to SQL editor. To start the application, choose Yes, start application in the dialog box that appears. Choose Save and run SQL. On the Real-time analytics tab, you can see all the in-application streams that the application created and verify the data.